In the past year I have not . . .
2) Worn a seatbelt while riding in a car. 6) Cooked anything in an oven. 7) Said “it’s cold” except when I was in an overly air conditioned movie theater, bus, restaurant ect. 8) Eaten steak, or really any form of beef. 9) Gone a day without eating rice. 10) Walked anywhere without carefully watching where I step so I can avoid the many creepy crawlies and the occasional elephant poop. 11) Walked into a public restroom expecting to find any of the following: a western toilet, toilet paper, soap or paper towels or any means of drying your hands. 12) I have not flushed toilet paper down the toilet. 13) Gone a day without smiling and laughing. It has been a great year and I will miss so many things about Thailand and I am looking forward to the day I get to come back again. After summer sch ool ended the Kirby's really needed to get away and relax so we planned a trip to the beach before the school started. We headed to Pranburi which is south of Hua Hin. This trip was much easier than our previous one to Kanchanaburi. Again we took the public bus, but it was a much shorter trip and the bus was much nicer. Once at the beach we finally relaxed. We stayed at a resort called Dolphin Bay that was perfect for families. The set up was great and allowed Rob and I a chance to lounge, read and even get a massage. The kids immediately made friends and spent their days playing in the pool and at the beach. After a few days of doing nothing we decided it was time to venture off the resort. We hired a local fisherman to take us out in his boat to do a little fishing. The trip out to the fishing spot was nice as we watched jellyfish float by. Once at the fishing spot we were given two fishing poles and 3 coke bottles with fishing line and a hook. We set about fishing. We didn't have much luck with the coke bottle, Chet finally caught one on it right before we headed back. Everyone caught a fish and of course yet again I out fished Rob. Although the fisherman out fished us all put together and he was using a coke bottle! When we finished fishing we headed back to the hotel and gave the fish to the hotel restaurant they cooked them up for us and we enjoyed a nice fish dinner that night. On our last day we took another trip off the resort to Monkey Island. Monkey island is an island that filled with monkeys that is very close to the resort. Again a local fisherman took us over to the island. Then he gave us bananas to feed the monkeys. Nell was very excited about this and I think it was her favorite part of our trip. All too soon it was time to head back home and start the school year. We really enjoyed our stay at Dolphin Bay and hope to go back again. Chet reeling in his first fish! Me with my first of many fish. Rob with his first fish, note how much smaller his is than mine. The kids with our haul. Chet and Katie waiting to dig into our fish dinner. Katie, Nell and Chet at Monkey Island. Last weekend was the beginning of Buddhist Lent, so I had two days off! We took our long weekend and headed to Kanchanburi to visit the Bridge over the river Kwai (pronounced like square with out the S) and Erawan National Park. Our journey began with a bus ride. We took a 2nd class air conditioned bus to Kanchanburi, it was only supposed to be 2 hours but with all the stops it took longer. Then we got on a local non air conditioned bus that was packed like sardines for another hour to our bus stop. From the bus stop we walked a ways before a hotel van picked us up and took us to the pier where we got on a long tail boat down the river Kwai to our hotel. To say the least we were in a very remote area. The first day we hung out at the hotel and the kids swam in the pool. Sunday we headed into town to visit the sites. For those of you might not be up on your history, during WWII the Japanese occupied parts of Thailand, including Kanchanburi. They set up prisoner of war camps here and used the prisoners to build a railroad that would connect Thailand and Burma (now Myanmar). We started with a stop at the cemetery then headed over to the Bridge over the River Kwai. We walked part of the way across and then had lunch on the river. The restaurant had fish food, so the kids had fun feeding the fish in the river, Mom and Dad enjoyed eating the yummy fish from the river. Next stop was the JEATH museum. I would definitely skip this one next time. Next up we headed to Hellfire Pass, which was just past our hotel. This was one of the most difficult parts of the railway has they had to cut through a large section of rock. The museum here was excellent and it was very interesting to walk along the trail and see the pass. I would definitely recommend that people take the extra time to come out here when visiting. Monday was our day to go to Erawan National park. We hired the most cautious songtow driver I have ever come across in Thailand. He drove very slow and slowed down for all the speed bumps! The only frightening thing was the hand gun we noticed half way through our trip in his glove box. Erawan National park consists of a series of 7 waterfalls. You hike along a trail to each of the falls stopping along the way to swim. The kids really enjoyed this. Nell especially liked the one you could slide down. 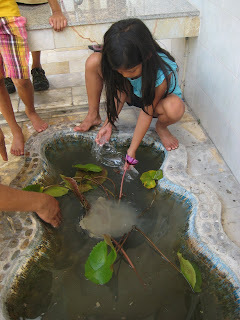 I liked the one that we dangled our feet in and little fish came up to us to nibble on our feet. Watch out for the big fish though they can hurt. Our trip ended on a very sad note. Our last night there we received word that Rob's Grandmother Gayle had passed away and that our basement in Illinois had flooded. This made the trip back rather somber. We will miss Gayle very much, but know that she led a long and full life. Last weekend we took the kids to see the Grand Palace in Bangkok. Rob and I have been before, but this was the first visit for the kids. We decided to go by water taxi, so we got on a bus and headed down to the pier in our town, Pakkred. When we arrived we saw a woman selling snakes and various sizes of turtles. Buddhists believe that you receive merit if you release animals back into the wild. 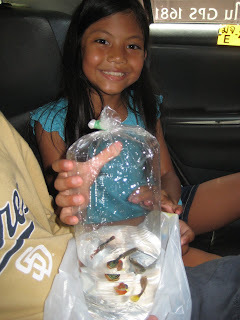 The kids were interested in trying this, so we purchased three small turtles for them to release in the river. After releasing the animals we asked which boat do we get on to get on to go to Bangkok they just laughed at us. After waiting and searching for a while a very nice woman called us over and explained the boat doesn't stop here on weekends only weekdays. We needed to go to the main pier in Nonthaburi, so we jumped in a taxi and were soon at the right pier. The boat ride into Bangkok was pleasant, as we got closer and closer the boat filled up more and more. When we got close to our stop we had to fight our way through all the people to the back to get off, fortunately we began our trip to the back a few stops early or we might not have made it. The boat drops you off right at the Grand Palace, so we ate lunch at a riverside restaurant and then headed over to see the sights. Rob and I had to buy tickets for 350 baht, the kids being Thai were free. They went through a separate entrance. Once inside everyone was amazed by the beauty. All three kids took lots of pictures. As we walked around we kept seeing the same two novice monks. They were about Chet's age maybe a year or two older. We think they may have been following us around. They kept looking at us, smiling and laughing and then running away. Nonthaburi Pier, if you look close you will see the light posts have Durian fruit hanging from them Nonthaburi is famous for it's Durian fruit. When we went on our excursion last week to Koh Kret I knew I wanted to buy a piece of pottery. I was thinking about getting something practical that we could use around the house. Originally I was thinking a flower pot, since we were going to buy plants that day as well. Then we were in a shop and Rob and I both saw the toilet paper holder and we knew that would be a most practical item to buy. For those of you who haven't traveled in Thailand or only ate and stayed at 5 star hotels and restaurants you may not understand how many uses toilet paper has in Thailand. At most restaurants including my school cafeteria there or no napkins to be seen, but on every table is a roll of toilet paper in a plastic holder. In many of the bathrooms, I am talking the nice ones there are no paper towels or hand dryers, but there is a big roll of toilet paper. In my classroom I have no Clorox wipes to clean after snack and no tissues for then kids noses, instead I have toilet paper. Of course there is also one thing that you must never do with your toilet paper in Thailand and that is flush it down the toilet! The plumbing just can't handle it and you will end up with a backed up toilet. Today we hired a taxi driver named Chanok who spoke English to take us around Nonthaburi. We started the morning by driving through the expensive well secured village that backs up to our house, Nichada Thani. Next he took us to the Royal Irrigation Department. This is where the King stores his boats on the Chao Phra River. There was a small temple/shrine as well as a site of an old temple from the Ayuthaya period. While we were looking at the river Nell spotted the largest snake I have ever seen floating in the river, don't worry it was dead. Check out Chet's blog for a photo. Next Chanok took us to Koh Kret, a small island known for its pottery. To get to the island you have to take a boat as there is no bridge. We walked around the island for a bit and saw how they make the pottery. Once we had toured the island it was time to cross back over the river and purchase some fish for our pond. Then we needed some plants to help shade our pond so we visited the plant store and purchased a lotus for the pond and a beautiful bougainvillea bush for in front of our house. I know many of you are wondering about the bugs and other creepy critters. As I wrote earlier, Katie ate a fried grub the other day that we got from a cart that came by our house. We have seen many lizards around our house and Rob even caught one in our bathroom. On my way to school I have seen many squashed toads and two squashed snakes in the road. At school the other day there was a live toad that hopped into the boys bathroom. After we had a very hard rainfall one day I came out from school to see a fish flopping on the road. I pointed it out to one of the office staff and they told the security guard so she could catch it and eat it. Unfortunately before she got to it a man on a motorcycle came by and scooped it up. That same day we learned that you always shake your shoes out before you put them on when Chet found a cockroach in his, (you leave your shoes outside so you never know who or what may have crawled in especially after it has been raining). 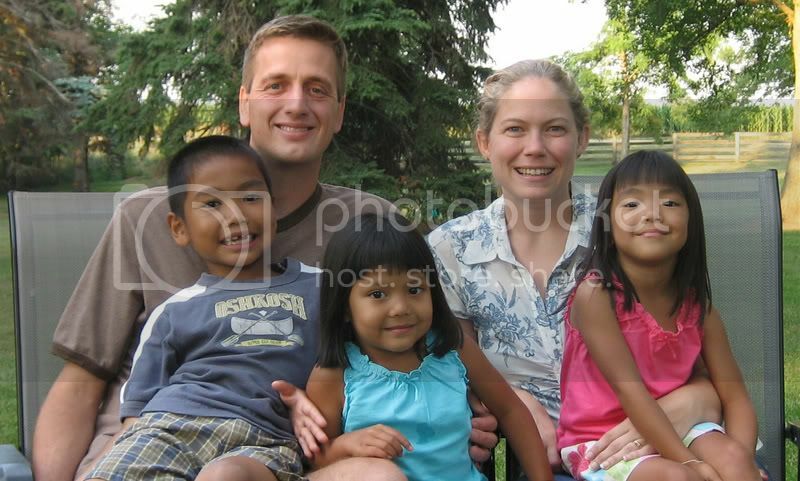 The Kirby Family is Rob, Darcie, Chet, Katie and Nel.